Consumer loan products are used as the basis of generating a Rate Table within a Consumer Loan Rate Sheet. The "Edit" button will allow you to change the settings of the product. After you click the "Edit" button, the "Save" button is how you save any changes you have made to the product. If you leave a relationship without saving, any changes you have made since the last save will be lost. The "Print" button allows you to print off the settings of this product. The "Print" button is not visible while editing. The "Close" button will leave the relationship and take you back to the Administration Section. Make sure that you save your work before closing if you would like to keep the changes you have made. 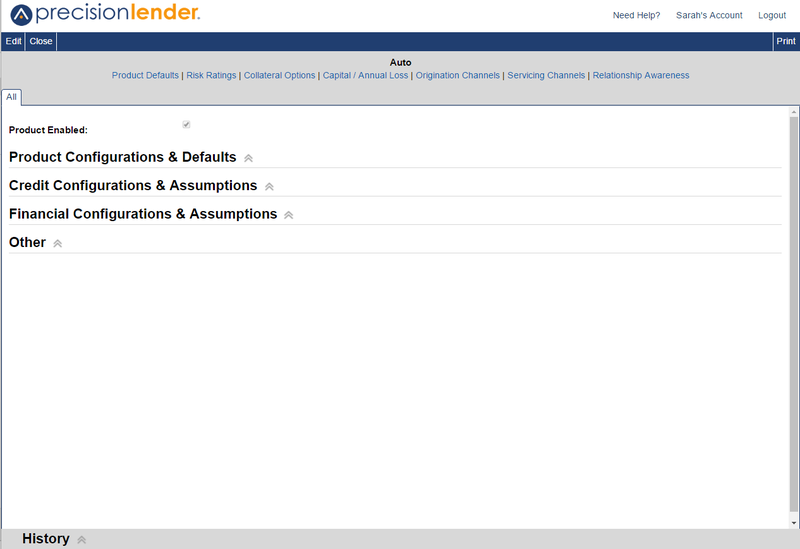 The name at the top of the header will be the name of the product and how it is referenced throughout PrecisionLender. This can be edited to match the name of the product at the financial institution. These blue links can be used to jump directly to sections on the screen. The tabs below the header represent different regions or groups of regions that have different assumption sets for the product. When checked, this product will be available to lenders for pricing. Regions for which these settings are active are signified with a check next to the region name. Allows you to choose regions to separate from this group of regions so they can have separate assumptions. Allows you to collapse this group of regions into another group of regions that you select. Only available if the Full Regionality and Advanced Funding module has been licensed. The payment type that will be originally set when a new rate sheet of this type is created. Checking the box will make that rate type available for this product. The rate type that will be originally set when a new rate sheet using this product is created. If checked, allows the user to see the Recovery Rate for a particular piece of collateral. Default rate that reflects the net expected proceeds, after all carrying and selling costs, in the event that liquidation of the collateral is required. Used in combination with the provided collateral value when pricing to accurately reflect the risk mitigation that particular piece of collateral provides. Default LTV that the institution configures in order to mirror its standard credit guidelines for lending in relation to a specific collateral type. Typically the Credit Capital and Annual Loss assumptions are based on the output of the credit migration analysis performed in consultation with PrecisionLender. Represents the capital necessary to hold against operational and market risk that exist no matter who your borrower is. Entered as a percentage of the loan balance plus a percentage of revenue. If you do not include capital in funding, you may use Net Interest Income as revenue, instead of Gross Revenue, in Operational Risk Capital Calculations. This option is enabled by default when creating new Consumer Loan products. Can also be set by Risk Rating within the Risk Ratings area. If set at Product and Risk Rating levels, the maximum of the two minimums will be used in computations by the math engine. If set at the Product and Risk Rating levels, the maximum of the two minimums will be used in computations by the math engine. When a loan is approaching maturity, some values can be overstated or understated due to the short term of the calculations. Any value entered here will override the 1-month default. This is used to set different origination fee defaults for loans coming through Relationship Awareness than the defaults for loans being priced. By checking the "Origination Fees" box you can enter a new Relationship Awareness-only default value. The History section at the bottom list all of the dates and times that changes were made to the product. By clicking on a date and time you can see the setting of the product that was saved at that date and time.